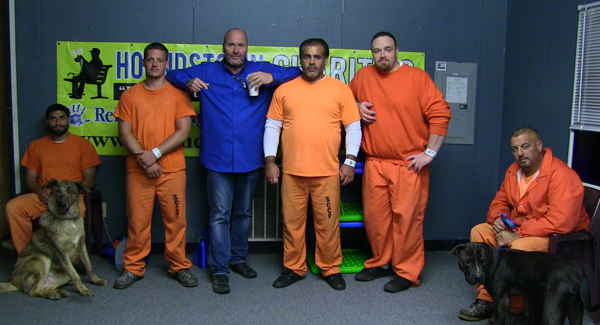 Six dogs in need of a home, six inmates in need of a fresh start, six weeks to change lives. 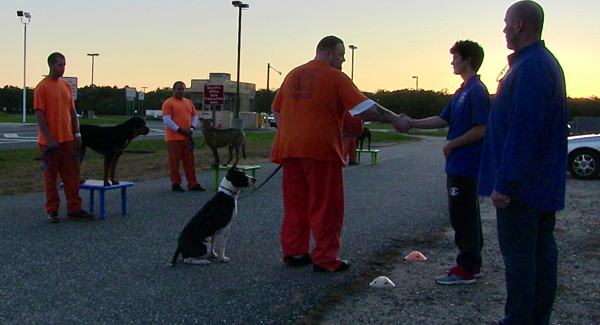 Handcuffs to Heeling was born out of the fundamentals of Hounds Town Charities: rehabilitating humans through animals. 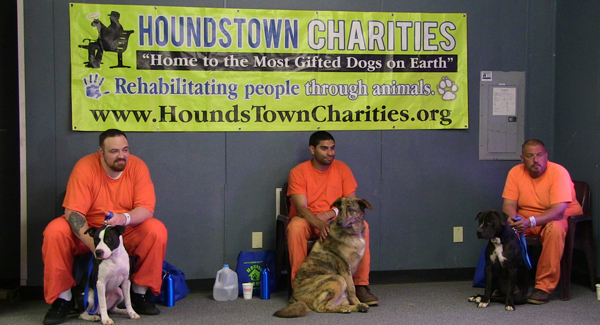 Hounds Town Charities President and Founder Michael Gould recently launched the long-anticipated pilot program that aims to transform the lives of six dogs, six inmates, and all the rest of us involved, at a local correctional facility. All of the dogs in the program with the exception of Scooby, an older shepherd mix, are pit bulls–an irony not lost on Gould. His philosophy on dog behavior has enabled him, his staff, and Hounds Town USA franchise owners to look past breed when welcoming dogs into their facilities for doggie daycare, as it means very little. Each week, we post PUPdates about our progress, and information about the dogs up for adoption through the program. Check out the latest news here, or follow us on Facebook here. Help a local homeless dog in need by becoming a sponsor! Corporate and individual sponsorship available for upcoming Handcuffs to Heeling programs. Contact us today! Know a dog that would benefit from participation in our program? Nominate him by emailing us here, or by posting his story on our Hounds Town Charities Facebook page. Check in with us here each week to follow our progress and help us get the dogs adopted! If you would like to bring this rehabilitation program to your area or to become a sponsor, please reach out to us about launching a Handcuffs to Heeling program in your community.